After breakfast, we will go south. We will stop in Ifrane, population of the Middle Atlas, at 1,713 meters of altitude and known as the "Switzerland of Morocco" for its alpine style. Then we will go to Azrou and stop in the cedar forests, where we can contemplate and even feed the Barbary macaques, unique in Africa and equal to the monkeys of Gibraltar. We will continue to Midelt, where we will have lunch. Next, we will cross the Tizi N Talghamt pass to reach Errachidia, with the impressive views of the Ziz gorges. Finally we will arrive at the desert of Merzouga. There they will stay in a hotel in front of the dunes, to dine and spend the night. After breakfast we will begin a 4 × 4 tour of the old tracks of the Paris-Dakar rally, with climbs, descents, dunes and oases. It is also possible to visit one of the many nomadic villages of the desert of Merzouga, in which the Berbers live in small adobe houses and wood, with nothing but their cattle. After lunch, we will return to the hotel in front of the dunes, where you can relax or, if you prefer, rent quads for an excursion. Before dusk they will make the journey in dromedary, with the opportunity to contemplate the wonderful sunset. They will arrive at the camp, where they will dine, enjoy the beat of the Bereber drums and spend the night in haimas. In the early morning, after breakfast, the camels will take you back to the car to continue our route. We will stop at Rissani to visit the traditional market. Then we will go to Tineghir and towards the Gorges of Todra, enjoying magnificent views along the way, overlooking the valley, full of palm trees and dotted with kasbahs. In the interior of the Todra gorges we will take a walk on foot to observe the impressive canyons. Then we will continue through Boumalne du Dades and the Valley of Roses, covered by hectares of rosebushes whose flowering extends from mid-April to mid-May. About 50 km further on, we will reach the extensive palm grove of Skoura, dotted with kasbahs, almost 200 cataloged. And finally we will arrive in Ouarzazate, where we will stay for dinner and spend the night. We will leave after breakfast and visit some movie studios in Ouarzazate, also known as the "Hollywood of Africa". 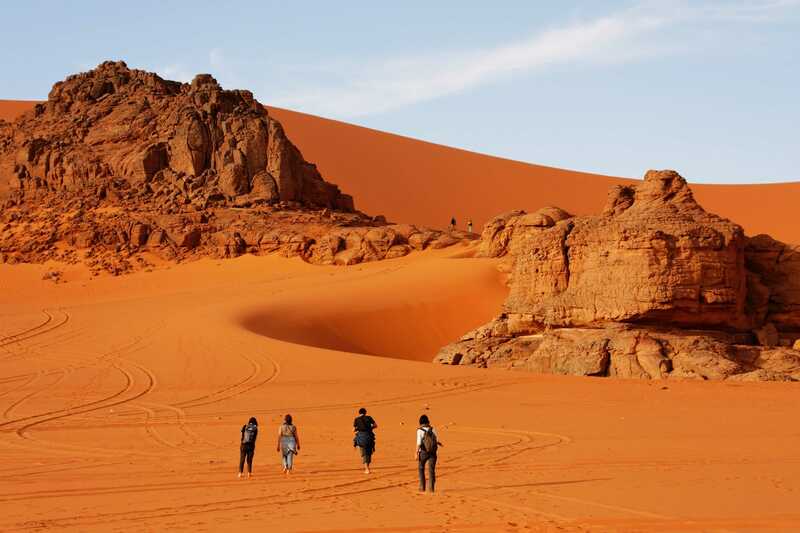 Then we will go to Ait Ben Haddou, whose image is very popular for having been chosen for the filming of countless and well-known films, such as Gladiator, The Jewel of the Nile or Game of Thrones. There we will visit the fortification and have lunch. Then we will continue the route by car through the High Atlas Mountains, stopping at Tizi N'Tichka (2260 m altitude) and at an argan oil cooperative, where they will be taught the traditional way of oil production. We will continue to Marrakech, with accommodation in the riad. After breakfast, a local guide will pick you up at the riad to accompany you throughout the morning on a visit to the most emblematic places of the city: the Jmaa el Fna square, the souk, the Medina of Marrakech, or monuments such as the Bahia Palace . After lunch, they will have the rest of the day off.